Frozen America the national weather channel announced this week! After the calendar flipped to 2018, the temperatures in north Florida dipped way low. Low by Florida standards of course. On Thursday morning, January 4, Jacksonville International Airport temps reached 27 degrees. The thermometer on our lanai registered 31 degrees, slightly higher because we live further east and closer to water. Plants under cover huddled together on our lanai hoping to survive. 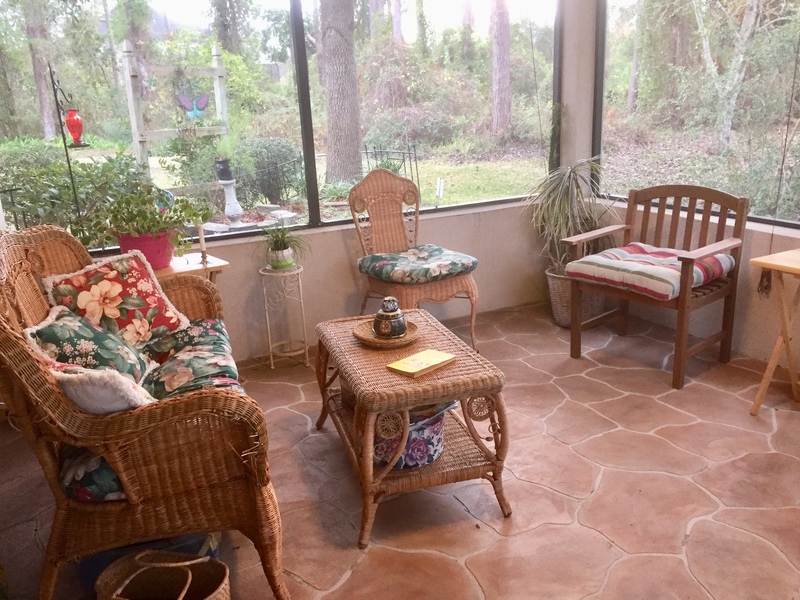 A far cry from the screened-in outdoorsy space we enjoy most of the year . 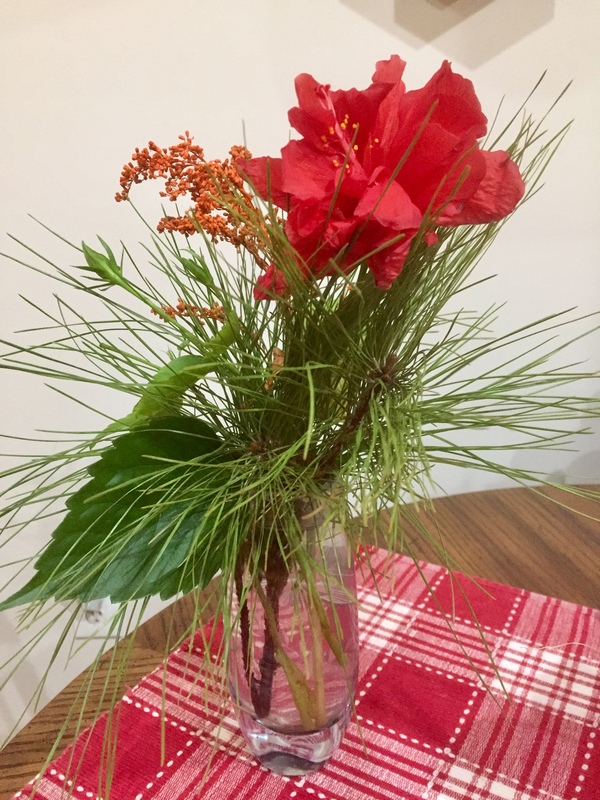 . .
Before the freeze, I snatched a crimson hibiscus from the stalk near the patio, rescuing it from certain death. 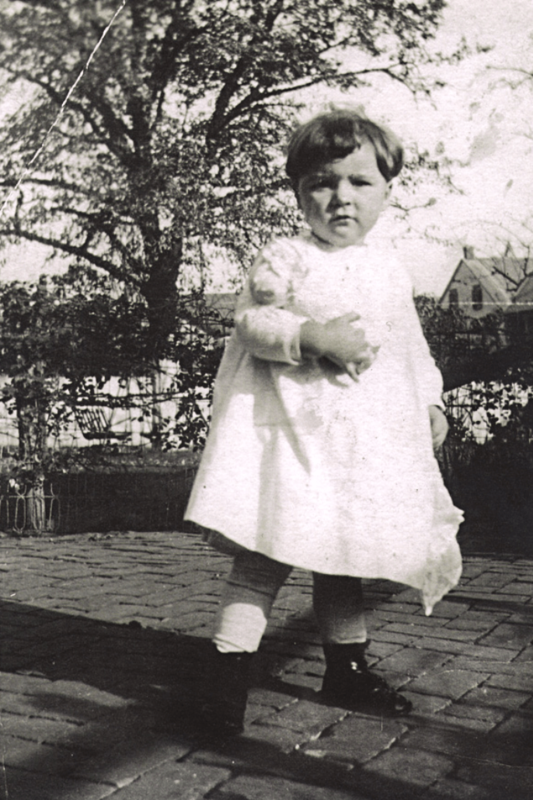 In 1921, when my Aunt Ruthie was 3 years old, her mother must have shielded her from freezing temperatures during the long Pennsylvania winter. 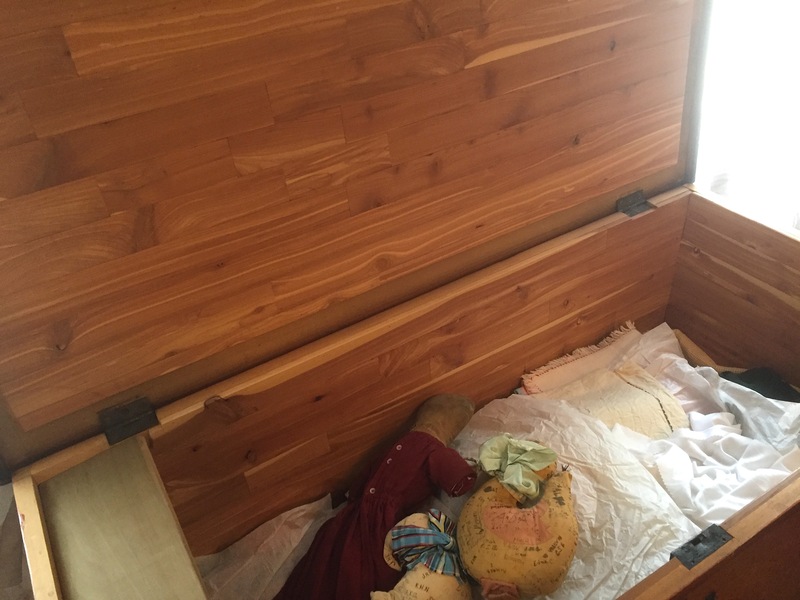 Last year we discovered deep in her cedar-lined painted chest a muff and neckpiece with a note attached. 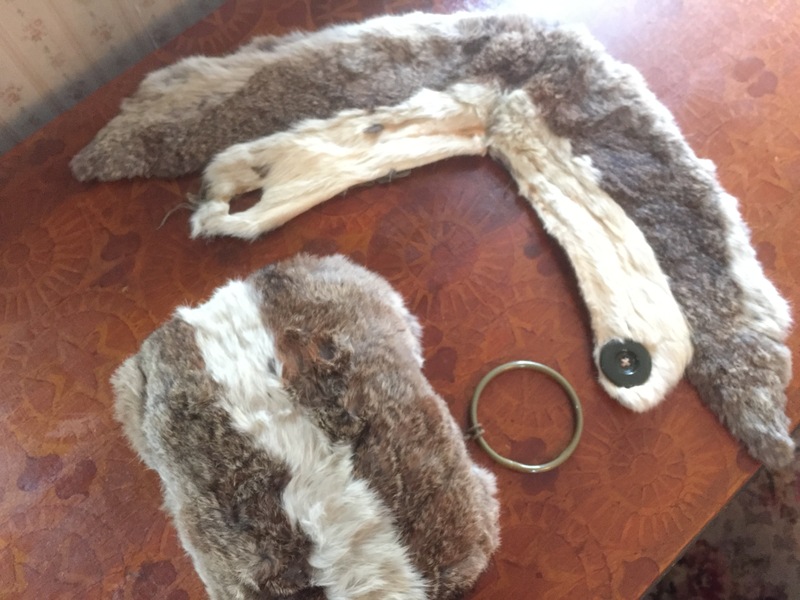 Our Aunt was understandably proud of her furry accessories, but acknowledged that she also wore hand-me-downs, probably some of my father’s coats, her older brother Ray. Long before recycling was popular, this Mennonite family like many others of the era practiced frugality. The lovely painted chest (1835) in which the muff and neckpiece were found has a carefully preserved provenance. On January 1, 2000, she recorded the history of the chest through another hand-written note again in cursive style. Ruth M. Longenecker received this chest for a H. S. graduation gift in 1935. 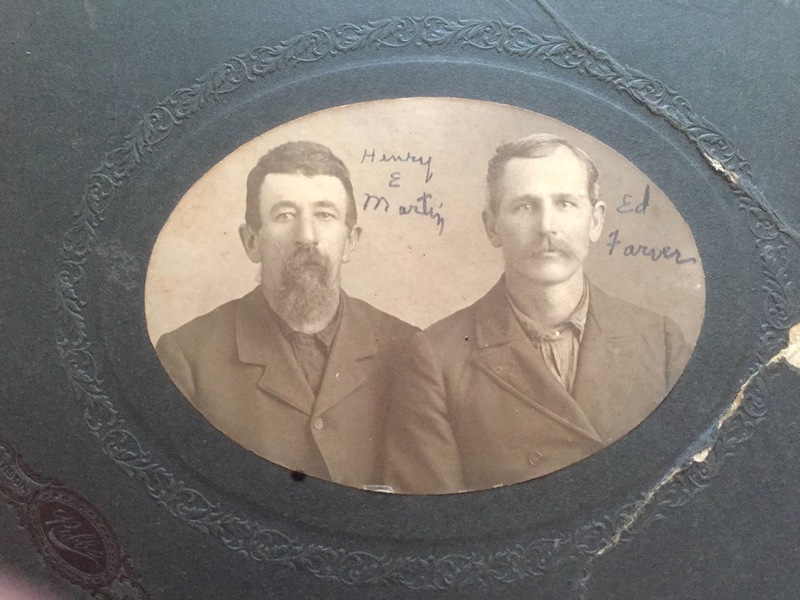 The chest was a gift from her parents, Fannie Martin Longenecker & Henry Risser Longenecker. 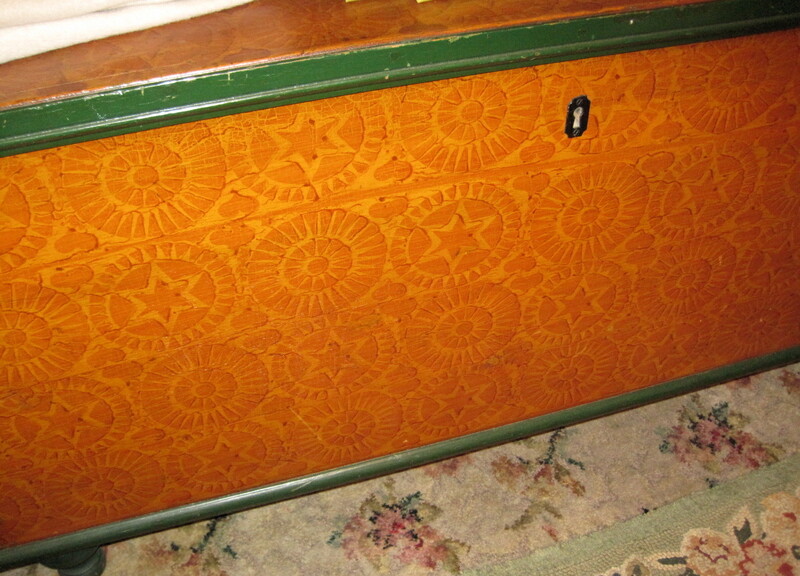 – Mr. Griffith, an antique restorer from E-Town cedar lined the chest. 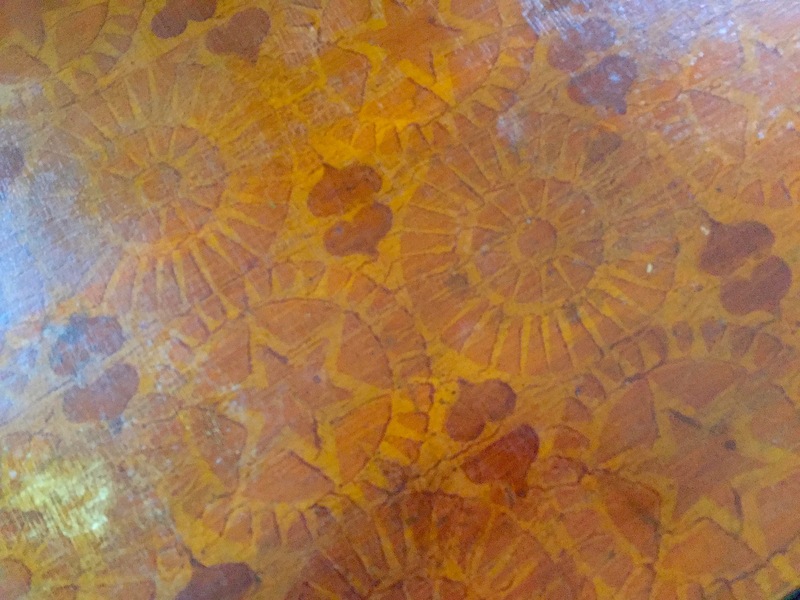 The 1835 stenciled date is under the cedar lining at the top of the lid. Do you recall what you wore as a child, especially in cold temperatures? Perhaps you have a special chest in your family. What is stored inside? How has the weather affected your activities lately? Good morning, Marian! I didn’t get an e-mail notification of this post–I just happened to see it on FB. I will try following again. I’m happy that the deep freeze is lifting here for a bit. Such wonderful articles to have, especially with the handwritten notes. That chest is beautiful! I remember there were some items of handmade clothing from when I was a child, some jumpers made by my grandmother and some sweater-jackets made by a great aunt. My younger sister wore mine after I outgrew them. But then, I wore some of my girls clothing when they outgrew them. 🙂 I guess the most special thing, is that my older daughter wore my wedding gown, altered a bit. Good morning to you too, Merril. Sorry you didn’t get a notification today. Sometimes connections come untethered. Let’s hope it’s only temporary. Thanks for taking care of the glitch on your end. Two special things stood out in your clothing story: your ability to wear your girls’ outfits when they outgrew them and a daughter wearing your wedding gown. I remember you posting the splendid photo of the gown. It strikes me that one way to stay stylish would be wearing your daughters’ clothing – ha! In her 30s, Crista and I did that a time or two I think . The email notification did come later, Marian. I wish I could still wear my girls’ clothing. I’m definitely a larger clothes size now, 🙁 and none of us wear the same shoe size. Sorry, my finger slipped…must be the cold.😀Twelve degrees is way too cold for the South. I’ve started my countdown until spring. 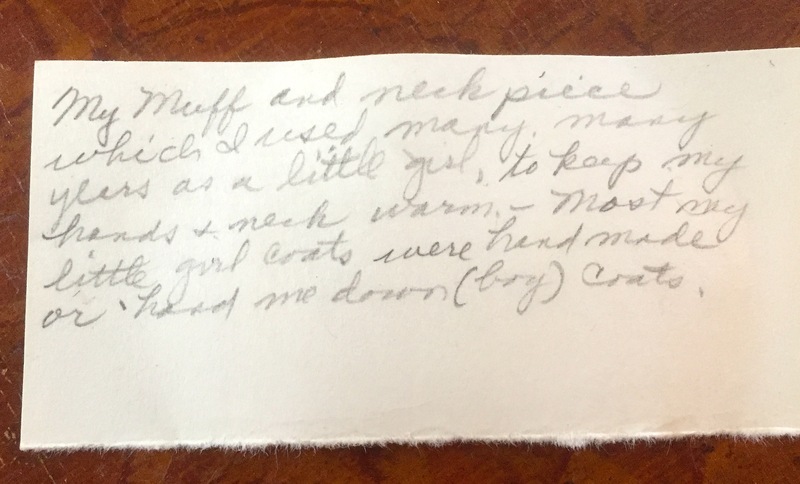 I love how Aunt Ruthy kept meticulous notes on things that were special to her. I love that chest! Yes, 12 degrees is way too cold for Charlotte, and you’re not even in the NC mountains. Jacksonville has warmed up quite a bit. Today the weatherman is predicting mid-70s. Typcially we have five warm days and five cooler ones. I certainly can’t complain. I’m glad you enjoyed the story of the chest, Jill. Aunt Ruthie kept the top of the chest heaped with bins of sewing items for her projects. I don’t think I ever looked inside until we curated her things last year. I suppose before she entered hospice care rummaging through would have felt like an invasion of her privacy. What lovely garments! And I love that painted chest too. I recall with great fondness a poncho with pompoms I had for a few years, aged around 11 and beyond, and I keep thinking about crocheting myself one, except that I intend to spend the next few winters in the sun! We also wore hand-me-downs; it was the standard thing with large families like mine in the 60s and 70s, as people couldn’t afford new clothes every year for each child (I am one of 10 children and most families in my neighbourhood were large). People weren’t quite so wasteful then and I still keep my clothes for a few years before I give them away to charity. How fortunate you now have a roaming life, so you can choose your geography and seasons. Happy trails! Another special artifact from Aunt Ruthie´s treasures. I recall having a fluffy white muff and matching earmuffs when I was a little girl. It could get very cold in the Canadian prairies, sometimes as low as -40 degrees. (which is the same in Fahrenheit and Celsius!) I love her neat handwriting. That chest is incredible!! Though Ruthie was left-handed, her handwriting always flowers to the right. As a child, I remember watching her scribe with ink in the days before ballpoint pens. You can gloat at the frosty temps in the British isles now that you live in Thailand, Carol. Thank you for commenting about the chest with the nostalgia you can appreciate. I look forward to your next recipes. I enjoy your yummy-looking photos whether I make the dish or not! My mother made all of our clothes from hand-me downs (we were 8 siblings) I wrote about this in one of my blog posts (Sept. 2017) http://ens-intransit.blogspot.com/. 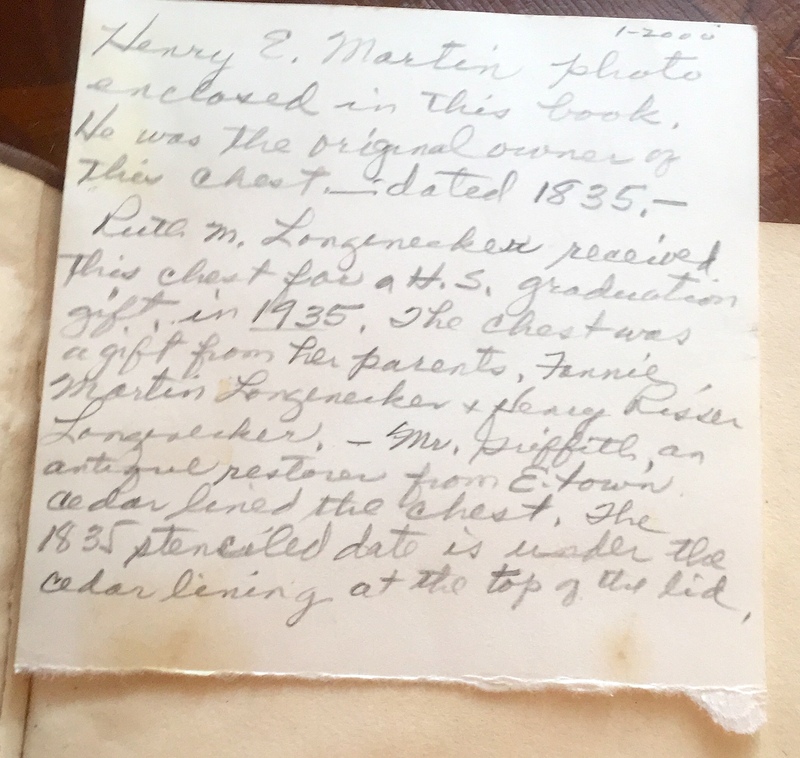 I love the way your aunt documented everything. I’ve been thinking about doing that, but it takes so much time! About 30 years ago we bought a cedar chest at a Mennonite Relief Sale in Kitchener, Ontario. I store blankets in it. Love the smell! I love that September post and remember reading it and leaving a comment which I re-read just a moment ago. My aunt documented many things with my sister Jean recording what she said, notebook in hand. This chest has more detail than most. A cedar chest is the perfect place to store blankets both for its rectangular shape and fragment smell. You are most fortunate. Thanks for contributing this, Elfrieda. I tried my sister’s peach tea today when my car’s battery died – Imagine! – right in front of her house. Marian — I love the handwritten notes your aunt Ruthie wrote, and that cedar-lined painted chest is incredible. There’s a book right there (think “The Lion, the Witch and the Wardrobe). I distinctly remember being 7-years old, sitting on the top of a bright yellow fire hydrant on Goldenrod Street and looking up at the sky to see if I could find shapes in the overhead clouds. I was wearing turquoise corduroy pants with a red path on each knee. That scene is indelibly printed on my brain. I remember wearing pants under dresses since we had to wear dresses all the time. I don’t remember wearing long underwear as a child, but we surely did sometimes because northern Indiana was often very cold and we’d wake up to frosty swirls on our windows upstairs because the rooms were so cold the frost would freeze on the windows. I too am impressed with the notes and impressive documentation you have of so much. My mom has written many notes on the things she hopes to pass on as well. Dad’s grandfather clock moved to the next generation (my brother, the youngest child) soon after Dad died, and that destination was written in a letter on a nail inside the clock that we all knew and understood from little up: that in this family, it was the youngest child who would inherit the clock. I too can distinctly remember “frost swirls on our windows upstairs” where we dressed on cold winter mornings. Lovely keepsakes Marian. I heard how cold it got in Florida, but 27 degrees would have seemed like summer here last week while we were in minus 40! LOL. Style maven that you’ve probably always been, I imagine you hated the bulkiness of those snowpants, a sensation I too remember. Even my ski pants as an adult feel stylish by comparison. I understand that by Toronto standards, 27 degrees may feel almost like a heat wave. Thank you for reading and registering your thoughts here, Debby – always appreciated. I’ve been hearing about the extreme cold in the US Marian especially on the east coast. And other awful extreme happenings in California. Fires, mudslides … Meanwhile parts of South Africa are in extreme drought and severe water restrictions are underway. The chest is beautiful – and the contents therein! A good friend of mine who lived in Canada for many years, gave me neck warmer made of rabbit fur when she returned to South Africa. Do I wear it? No, it’s not really necessary though believe me in winter our temperatures can easily drop to below freezing. Wouldn’t it be lovely if we could even things out: deliver water to the drought-stricken and end fires everywhere. This past year British Columbia, Canada and California in the US enduring frightful fires. Somehow I can imagine you in a pink tutu, but I’m not sure the same about the frog costume – ha! It’s always nice to see your smile in this column. Thanks always for reading and commenting, Susan. Hope both you and the plants survive – and thrive! Most everything did survive, Fiona. The rosemary looks a little frostbitten though: I didn’t bring it in in time. However, I think it will bounce back. I hope your days will be a little less hectic now. Good morning, Pamela. You mention yoga and meditation. Yesterday I wore my Fitbit to my Pilates class. Even though I feel stiff (again!) this morning, I feel a mini-surge of energy. (Is that possible, a mini-surge?) and perhaps a tad more feeling of love. You are well on your way to shining love through your writing in the new year. Have a great weekend! Thank you for sharing your memories here, Liesbet. I imagined Belgium having lots of snow in the winter. Years ago, we took a speedy train through Belgium on our way from Paris to Amsterdam. I remember wishing we’d have a stop-over in Bruges to see lacemaking, at least. A little late but however worth it . Thank you for taking the time to send your blog again . Loved seeing photos of your family , delightful . We are experiencing a cold winter here in West Wales too. I also had a corona bottle for a hot water bottle ( only warm warm water of course) I loved to feel the little bobbles on the bottle with my feet . Such memories 😊 You keep warm too Marian my sweet . West Wales would naturally be cold in January, but in “sunny” Florida we are bearing down for a second cold snap of the month with temps in the high 20s for the next two nights. 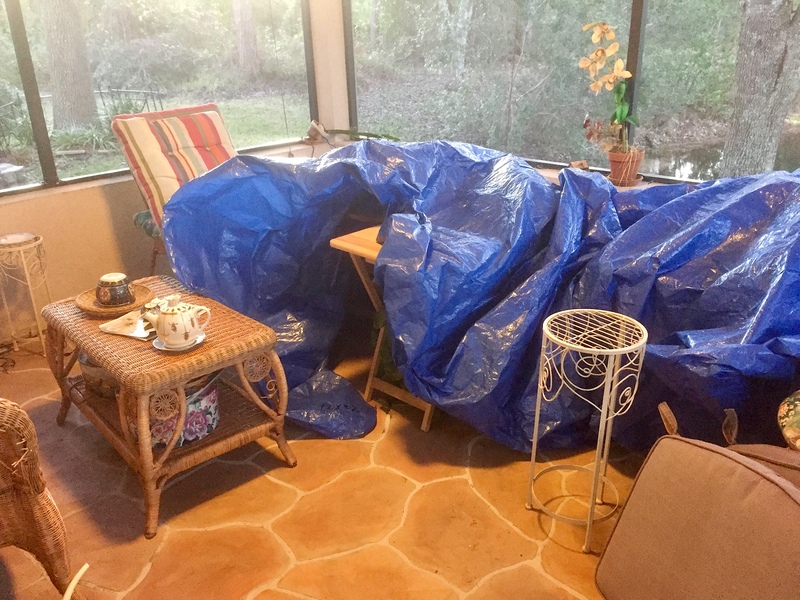 If I want to hold onto my azaleas and hibiscus, I’ll have to cover them in warm blankets. I love the huddling plants. I want to be in the middle. It was so cold here and now all the snow melted and yesterday was in the 50s. Weather remains wild most places. I’m sorry I’m so late in reading and responding. I had a feverish flu twice in January, the second time rougher than the first. And at the same time, I’m moving my mother-in-law to a nursing home (or moving step-by-step in that direction) because she’s running out of money and I’m running out of vitality. It’s hard. It’s time consuming (you know that). It’s painful and she doesn’t know yet because she can’t retain anything for more than 20 seconds. I guess she’ll figure it out when we make the move, whenever that is. My son will help with the move and health aides will pack up her few remaining belongings, but we’re on hold now waiting to get paperwork completed and an open bed in the place that’s best. Hospice will help since she’s on service until early March but will be released because she got better. I’ll get through this, but how I’ll keep the other balls in the air or continue to have any life of my own, I do not know. I’m not sure my mother born in 1915 in Ohio ever had a new anything as a girl. She desperately needed dental care and didn’t get it. They finally got her glasses because the school insisted, but there was no money. My granddad lost everything in the depression and they all suffered. My mother longed for a doll. There were few items left of any value because everything was sold to buy food. You don’t need to hear “Things will get better” because you know they will, but you do need to be cuddled. I hope you can feel the hugs from afar. I often wish that my feels of empathy for others, especially you now, would translate into less weight on your tired shoulders. Of course, when you are sick, nothing feels right. This endless vigil you are keeping is the worst thing, most likely. But it ends abruptly and then a cascade of new feelings appear. Trust me, you have done better than your best by a difficult personality. A chorus of your friends/followers would agree. I’m glad your son and health aides will help with Virginia’s final move. And as you know, Medicaid kicks in when personal funds run out.